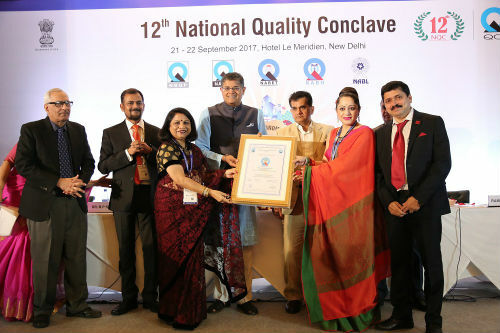 Chandigarh, 22nd September 2017 – Chitkara International School, Chandigarh has received National Accreditation Board for Education and Training (NABET) School Accreditation Certificate from the Quality Council of India (QCI) at the 12th Quality Council Conclave held in Delhi on 21st September 2017. Quality Council of India is a Government of India body that assures quality standards across all spheres of economic, social and educational activities. Dr. Madhu Chitkara, Chairperson, Chitkara International School and Dr. Niyati Chitkara, Principal, Chitkara International School received the Accreditation Certificate from Mr. Baijayant ‘Jay’ Panda, Member of Parliament and Mr. Amitabh Kant, CEO, NITI Aayog in the presence of more than 800 delegates including key policy and decision makers, national and international experts, industry leaders, managers from Public and private sectors, educational institutions, Govt. departments, scientific and professional institutions, NGO’s, academicians and all other stakeholders. QCI’s evaluation process includes a methodical assessment of all processes like educational & support processes, Academic curriculum, Examination & assessments, infrastructure, health and safety etc. The School has been assessed and found to be complying with NABET requirement as per Accreditation Standard for Quality School Governance. Mr. Piyush Goyal, Hon’ble Minister of Railways & Coal was the Guest of Honor and Mr. Suresh Prabhu, Hon’ble Minister of Commerce & Industries was the Chief Guest of the event and they addressed the audience after the felicitation Ceremony. Other dignitaries who graced the event were, Mr. Ramesh Abhishek, Secretary DIPP, Mr. Adil Zainulbhai, Chairman, QCI and Mr. R Mukundan, Chairman, NBQP. Chitkara International School (CIS) is the fruition of the dream of its founder to create great leaders who exude excellence. The school is a pioneering initiative in international education in Chandigarh. Since its inception, the focus has been on building a world-class school with an Indian mind, heart and soul that offers a blend of nationally and internationally acclaimed educational opportunities. 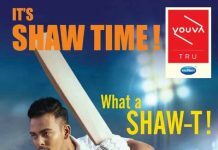 The school is affiliated to CBSE and through its inquiry based curriculum and continuous comprehensive method of assessment; it has raised the bar of global and international education in the city. Chitkara International School is a conscious attempt at evolving newer ways of learning and thinking, an attempt at going beyond structured schooling to inculcate the joyful freedom of inner growth. The school provides learning opportunities which appeal to children’s multiple intelligences and trigger in them a multiplicity of perspectives through an eclectic mix of activities, intellectual accomplishments, aesthetic appreciation and sporting success, and thus encourage them to participate fully in the richness of school life.